A call tracking platform helps you efficiently manage and track your business calls. It provides detailed insights into the caller behavior and demographics to optimize your marketing campaigns. Phonexa’s Call Logic platform collects data on all your inbound marketing calls and uses sophisticated analytics to boost your existing sales applications and improve your marketing ROI. When you know which marketing campaigns are generating the highest number of leads and conversions, it becomes that much easier to get the most out of your marketing dollars. Phonexa’s Call Logic platform gives you the ability to attribute calls to specific marketing efforts, allowing you to make informed decisions on where to channel your resources. Every call is loaded with information about your target audience. Call Logic not only gathers that data for you, but also provides you with intuitive reports and visuals to help you and your team evaluate and take action on your campaigns. With a comprehensive understanding of market trends, you’ll have a clear competitive edge for future campaigns. 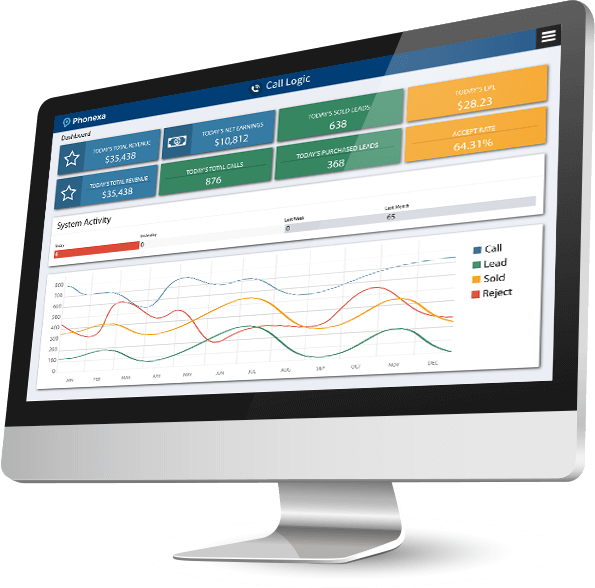 Call Logic will provide your business with an array of call management tools that help enhance your customer’s experience. Interactive Voice Response (IVR) greets incoming calls with ease while the Automatic Call Distributor ensures prospects are connected with the right department. Call Recording allows you to review caller interactions, improve your customer service, and attract a surplus of positive reviews. With automation handling call management and campaign analytics taking care of painstaking data collection, Call Logic frees you to spend more time optimizing your business. Customization options and seamless API integration make it easier for your business to adjust as needed, clearing the path for your business to scale up and expand at will. Ready to optimize your campaigns and maximize your marketing spend? When a prospect responds to your ad by dialing a number they’ve seen or hitting a click-to-call prompt, Phonexa begins the tracking process and absorbs all the relevant data into the cloud. Phonexa will capture your callers’ information based on the number they’ve dialed, the location they called from, and the incentive for the call. A lead is automatically generated, forever logged and searchable in your database. Prospects are connected to your custom voice greeting through Phonexa’s Interactive Voice Response (IVR) and can engage and share their interest via VoicePLUS, our voice recognition solution. Information gathered by the IVR allows calls to be filtered through the Automatic Call Distributor so that callers are quickly connected to the appropriate agents. All relevant details collected during the call are recorded and become available on Phonexa’s user-friendly dashboard. Select calls will be recorded and stored for quality assurance considerations. The data generated from the call becomes available to you immediately, becoming part of a vast array of information that can help you optimize your campaign or better connect with your target audience. Want to manage your leads efficiently and maximize conversions? Ready to enhance the performance of your campaigns and increase your marketing ROI?